Jim Malone says: "Candidates will be standing on a basis of fighting for workers." A coalition party of left-wingers have launched their manifesto for the 6 May general election. Former Solidarity MSP Tommy Sheridan is a candidate for the Trade Unionist and Socialist Coalition (TUSC). The group is contesting 42 seats across the UK, and 10 in Scotland with Mr Sheridan standing in the Glasgow South West seat. 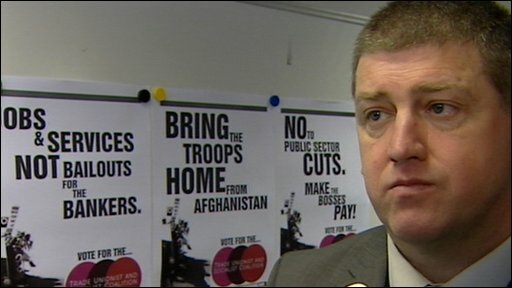 The launch, which was spearheaded by union chief Bob Crow, was held at the Scottish TUC conference in Dundee. The party said Labour had become a party of big business, leaving trade unionists disenfranchised. The manifesto of the Trade Unionist and Socialist Coalition (TUSC) and Scottish Trade Unionist and Socialist Coalition outlines the grouping's opposition to all cuts in public services and it also calls for the privatised utilities to be brought back into public ownership. The group is also opposed to the privatisation of Royal Mail. In addition, the manifesto calls for the repeal of what it describes as anti-trade union laws. Mr Crow, who is general secretary of the RMT, said: "Gordon Brown has supported the management in every industrial dispute since Labour came to power over a decade ago. What conclusion should workers and trade unionists draw? We've been disenfranchised." He said the TUSC and STUSC were the only people to put forward a pro-union, pro-worker programme instead of the cuts, privatisation and deregulation offered by the other parties. Mr Crow added: "The disgust and disillusionment that people feel for the sleaze-ridden main parties is leaving the door wide-open to the likes of the British National Party. Trade unionists have a duty to take a lead in organising a political alternative." Mr Sheridan said before the launch, which he was unable to attend: "Whilst the bookies and the chattering classes speculate on who will win the next general election it is already clear who the losers will be. "Pensioners, the sick, the unemployed, the poor and working class communities the length and breadth of the country will find themselves under increasing attack as the political consensus of the main parties scapegoats them for the financial crisis." He added: "The manifesto prepared by TUSC and STUSC shows that we are unequivocally on the side of those people who will suffer the most whichever one of the three main parties wins the general election."